Over the years, birdMAN and I have developed a killer spicy chili. 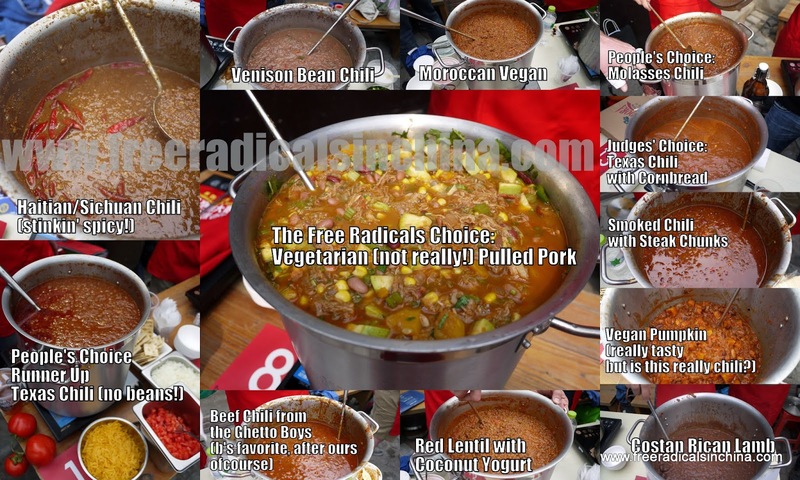 Our chili includes zucchini, banana squash, ground turkey, and jalapeno chilies. Now I know die-hard chili lovers would protest. Yeah, yeah, it’s true-- the original Texas chili does not include beans, and definitely not vegetables. But hey, we are from California. And in California, everything is better with garden fresh vegetables. In China, we have made some modifications to our California chili. We will call it California-inspired Chinese chili. Chinese pumpkin for the banana squash, xihulu (西葫芦）for the zucchini, cloud beans (云豆) for the white and pinto beans, Chinese chilies for the jalapenos, and pork for the ground turkey. 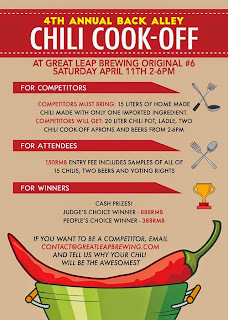 So one evening, at Great Leap Brewery as we sipped our beers and stared at a poster inviting applicants for the 4th Annual Back-alley Chili Cook-off, we thought, hey, our chili is awesome. Oh, and free beer? Sign us up! Our one imported ingredient? Chili powder of course! A couple weeks later, after a chili-making trial run, 3 bike trips to the market (my bike basket only holds so much), and hours of birdMAN’s meticulous chopping, we found ourselves carrying almost 20 liters of piping hot pulled pork chili through Doujiao Hutong to Great Leap Brewing (GLB). The entire afternoon, 12 boiling concoctions of onion, garlic, meat, beans, and chili spice perfumed GLB’s quaint courtyard. 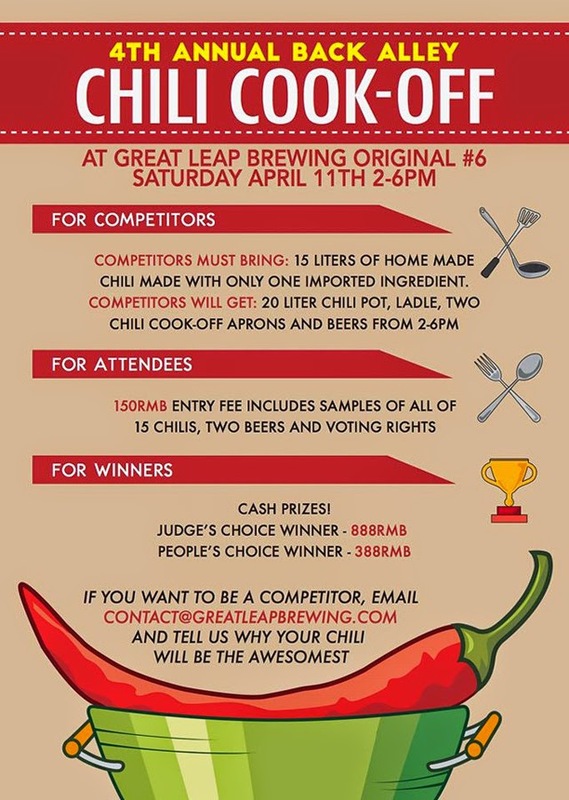 Attenders and contestants alike sampled chili and, of course, sipped beer. Chilies varied from vegan curry pumpkin (awesome, but was it really chili or just pumpkin lentil stew? ), to dried beef and venison. Contestants were allowed one imported ingredient. What the chefs threw in their chili relied on the honor system. If chefs broke the rule and added additional imported ingredients, GLB warned them that karma would reward them with a wicked case of 拉肚子 (diarrhea). As far as I know, no one was plagued with 拉肚子. However, the free flowing beer and generous helpings of chili surely left some tummies stretched to the limits with yeast and gas. We thought our chili was amazingly flavorful loaded with veggies and shredded pork balanced with hot chilies and a cilantro. However, Texas triumphed California. A true-blooded Texas couple took the judges’ chili heart with a traditional meat chili served over cornbread. I have to admit...it was pretty tasty. The people’s choice went to our chili hot plate neighbor, Charlie. He brought about 20 of his closest friends, each wearing T-shirts with his face emblazoned across the front. His chili was unusual-- an initial kick of spice followed by an uber sweet amalgam of Sichuan molasses and rye whiskey. A little too sweet for our tastes, but the flavor was kick-you-in-taste-buds memorable. Charlie’s girlfriend said she thought our chili was the best. I guess I forgive her for voting for her boyfriend and not us. The second place for people choice went Andy’s chili, also a traditional Texas chili. Texas would be proud that its chili con carne tradition has leaped the Pacific, and is alive and thriving in one of the world’s most populous cities filled with noodle-loving people. Well, on that particularly drizzly afternoon, the GLB hutong courtyard certainly had more beer-loving-chili-chugging people than noodle-loving people. And we were shamelessly of the beer-loving-chili-chugging sort. Good thing we sort of work out. Chili is heavy!